Use cool power ups to solve the toughest puzzles in style. Lollipop: Sweet Taste is the match-3 game that you have been searching for. This game brings over 1200 amazing match-3 puzzles for you to solve. With colorful graphics and a highly addicting game play, this game is a must try. The game mechanics are similar to traditional match-3 games. You have to match similar candies by moving the candies adjacent to each other in all four directions. In each mission, you will have to collect certain number of mouth-watering candies in a limited number of moves so make sure you use your moves wisely. Lollipop: Sweet Taste truly brings an endlessly entertaining experience with over 1200 unique puzzles for you to solve. Each puzzle has exciting objectives for you to complete like collecting delicious brownies, gathering strawberry flavored candies and more. You only have a limited number of moves to solve the puzzle and you can only unlock the next tougher one by solving it successfully. You can also score a perfect three stars rating in each level of the game if you are good enough. As you have a limited amount of moves, you get a bonus for all the moves left at the end of completing the level. This moves bonus can really boost up your score to get the perfect three stars and the cool rewards that come with them. 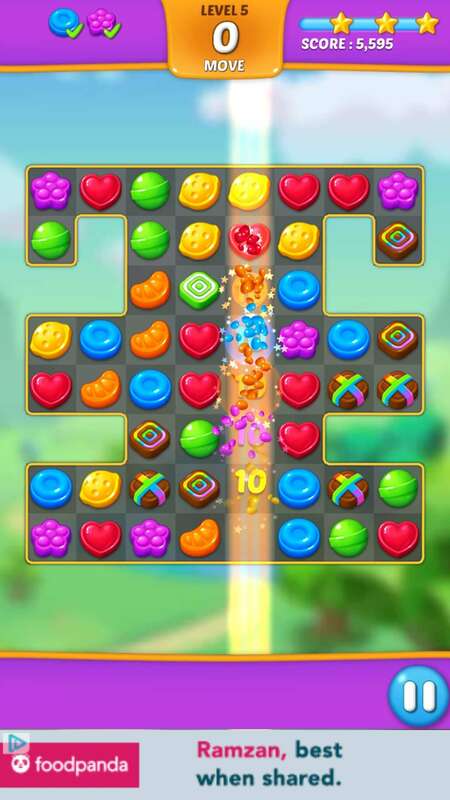 In order to save moves, you can match four or five similar candies that can unleash special candies capable of eliminating entire rows and columns in a single move. The game also has cool power ups that can come in really handy if you are finding a puzzle too hard to solve with the given number of moves. These power ups include additional moves, a hammer that can eliminate one candy of your choice and several others. You can purchase the power ups with coins or win them by opening treasure chests that you will receive after completing different puzzles in the game. 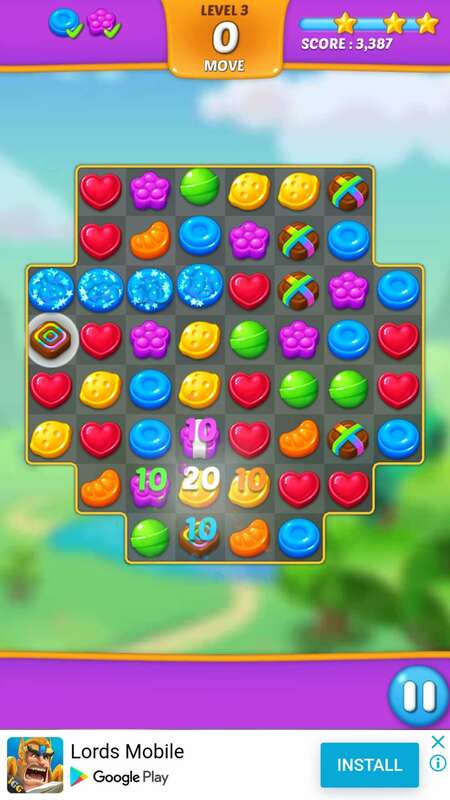 Lollipop: Sweet Taste brings some really stunning visuals to the screens with a colorful interface and exciting win screens for each puzzle. You get to enjoy amazing background themes in various chapters along with cool sound effects and catchy background tunes. If you are running out of resources in the game, you can always hit the game shop and purchase all that you need with real money through secured payment methods. The store features amazing discounted deals that can offer you a great value for your money. Good at solving puzzles? 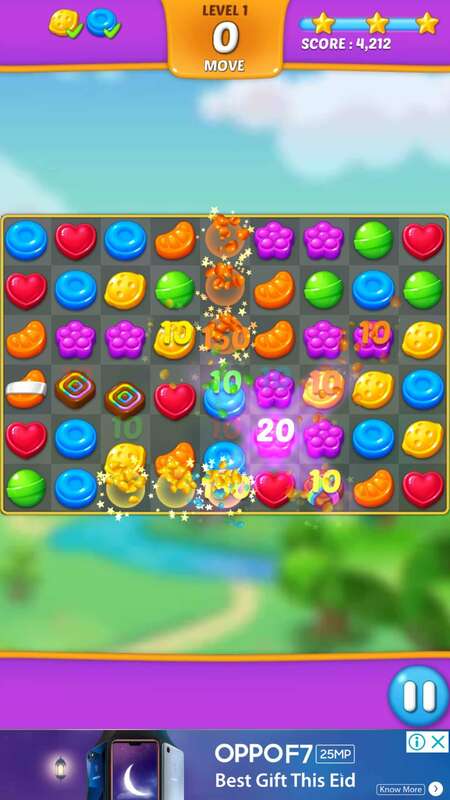 Try out this amazing match-3 game and collect the most delicious candies along the way. Play over 1200 unique levels in amazing themed backgrounds. Use cool power ups to solve the trickiest puzzles with ease. Try out Lollipop: Sweet Taste for some endless entertainment.